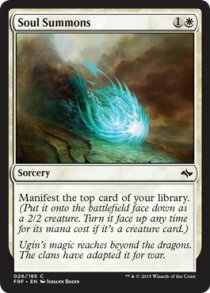 Manifest is een ability die voorkomt op sommige kaarten uit Fate Reforged . Hoewel het idee heel simpel en elegant is, zitten er regeltechnisch flink wat haken en ogen aan. Daarom in het Nederlands een korte uitleg van de belangrijkste dingen (die in 99% van de gevallen al je vragen zal beantwoorden), en daaronder in het Engels alle belangrijke stukken uit de Comprehensive Rules die betrekking hebben op Manifest. Een spell of effect kan je de opdracht geven om de bovenste kaart van je library te manifesten. Dat wil zeggen dat je die kaart face-down op het battlefield legt; alle face-down kaarten zijn automatisch 2/2 creatures zonder naam, mana cost et cetera, net zoals morph creatures. Als je een non-creature kaart op die manier hebt gemanifest, is het verhaal daarmee eigenlijk klaar. Als je een creature kaart hebt gemanifest, mag je hem op elk moment dat je priority hebt face-up draaien door zijn casting cost te betalen. Als je een creature met de morph ability door een manifest-effect face-down hebt neergelegd, heeft hij ook nog steeds de morph ability en mag je hem voor zijn morph cost face-up draaien (of voor zijn casting cost, die ability heeft hij namelijk ook nog steeds). Als een gemanifeste kaart op de een of andere manier het battlefield verlaat en aan het einde van het spel, moet je de kaart revealen. En da's het hele verhaal! Om dit technisch werkend te krijgen, waren er helaas een stuk meer woorden nodig... maar die kun je hieronder in het Engels nalezen als je ze nodig hebt. 701.31a "Manifest [a card]" means "Put [that card] onto the battlefield face down." That permanent is a 2/2 creature with no text, no name, no subtypes, and no mana cost. That permanent is a manifested permanent as long as it's face down. The effect defining its characteristics works any time the card is face down and ends when it's turned face up. 701.31b Any time you have priority, you may turn a manifested permanent you control face up. This is a special action that doesn't use the stack (see rule 115.2b). To do this, show all players that the card representing that permanent is a creature card and what its mana cost is, pay that cost, then turn the permanent face up. The effect defining its characteristics while it was face down ends, and it regains its normal characteristics. If the card representing that permanent isn't a creature card or doesn't have a mana cost, it can't be turned face up this way. 701.31c If a card with morph is manifested, its controller may use the procedure described in rule 702.36d to turn a face-down permanent with morph face up rather than the procedure described above to turn a manifested permanent face up. 701.31d If an effect instructs a player to manifest multiple cards from his or her library, those cards are manifested one at a time. 701.31e A face-down permanent represented by an instant or sorcery card can't be turned face up. If an effect instructs a player to turn one face up, its controller reveals it and leaves it face down. Abilities that trigger whenever a permanent is turned face up won't trigger. 701.31f See rule 707, "Face-Down Spells and Permanents," for more information. * The face-down permanent is a 2/2 creature with no name, mana cost, creature types, or abilities. It's colorless and has a converted mana cost of 0. Other effects that apply to the permanent can still grant or change any of these characteristics. * Any time you have priority, you may turn a manifested creature face up by revealing that it's a creature card (ignoring any type-changing effects that might be applying to it) and paying its mana cost. This is a special action. It doesn't use the stack and can't be responded to. * If a manifested creature would have morph if it were face up, you may also turn it face up by paying its morph cost. * Unlike a face-down creature that was cast using the morph ability, a manifested creature may still be turned face up after it loses its abilities if it's a creature card. * Because the permanent is on the battlefield both before and after it's turned face up, turning a permanent face up doesn't cause any enters-the-battlefield abilities to trigger. * Because face-down creatures don't have a name, they can't have the same name as any other creature, even another face-down creature. * A permanent that turns face up or face down changes characteristics but is otherwise the same permanent. Spells and abilities that were targeting that permanent, as well as Auras and Equipment that were attached to the permanent, aren't affected. * Turning a permanent face up or face down doesn't change whether that permanent is tapped or untapped. * At any time, you can look at a face-down permanent you control. 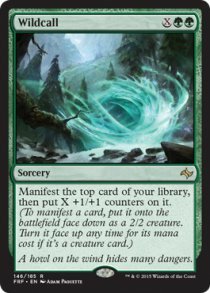 You can't look at face-down permanents you don't control unless an effect instructs you to do so. * If a face-down permanent you control leaves the battlefield, you must reveal it. You must also reveal all face-down spells and permanents you control if you leave the game or if the game ends. * You must ensure that your face-down spells and permanents can easily be differentiated from each other. You're not allowed to mix up the cards that represent them on the battlefield in order to confuse other players. The order they entered the battlefield should remain clear. Common methods for indicating this include using markers or dice, or simply placing them in order on the battlefield. You must also track how each became face down (manifested, cast face down using the morph ability, and so on). 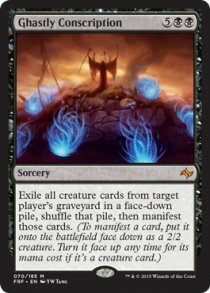 * There are no cards in the Fate Reforged set that would turn a face-down instant or sorcery card on the battlefield face up, but some older cards can try to do this. If something tries to turn a face-down instant or sorcery card on the battlefield face up, reveal that card to show all players it's an instant or sorcery card. The permanent remains on the battlefield face down. Abilities that trigger when a permanent turns face up won't trigger, because even though you revealed the card, it never turned face up. * Some older Magic sets feature double-faced cards, which have a Magic card face on each side rather than a Magic card face on one side and a Magic card back on the other. The rules for double-faced cards are changing slightly to account for the possibility that they are manifested. If a double-faced card is manifested, it will be put onto the battlefield face down. While face down, it can't transform. If the front face of the card is a creature card, you can turn it face up by paying its mana cost. If you do, its front face will be up. A double-faced card on the battlefield still can't be turned face down.